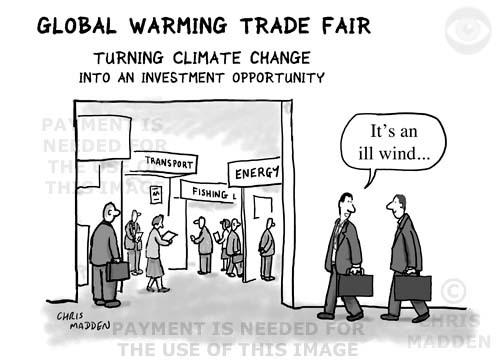 Showing business opportunities created by global warming. The joke is based on the saying “It’s an ill wind that blows nobody good” (meaning that someone always benefits from any situation, including bad ones). 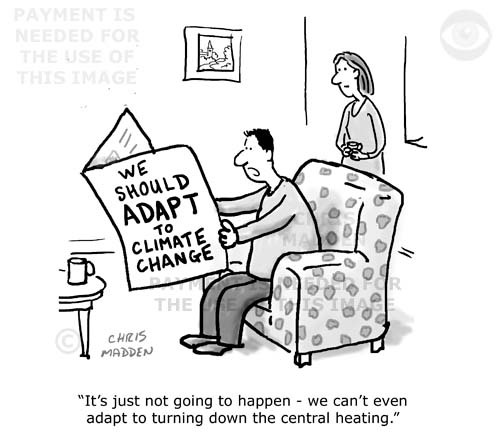 The cartoon is meant as a criticism of cynical profiteering from climate change – it’s not a criticism of pragmatic approaches to job creation as a result of climate change. Cartoon about art gallery and museum mechandising and funding. Which works of art would look good on fridge magnets? 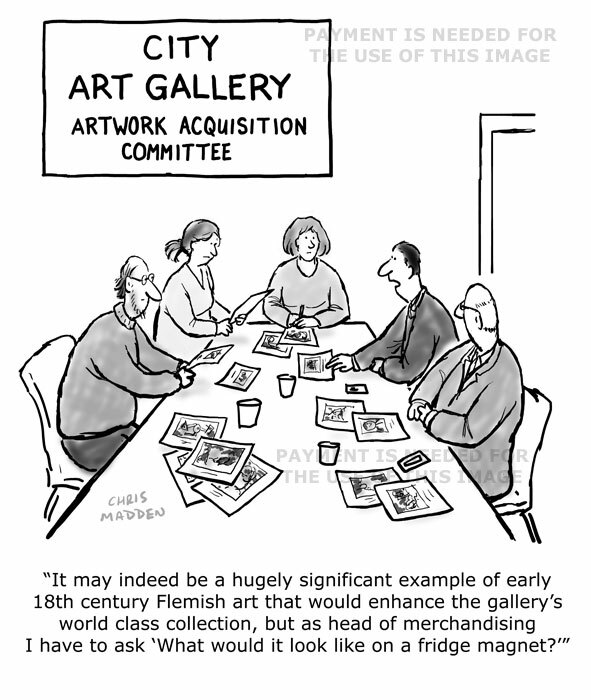 Cartoon showing a meeting of staff responsible for acquiring artworks in an art gallery considering which works of art to buy, including evaluating the commercial, marketing and merchandising potential of the works of art under consideration. It is a cartoon about the commercialisation and commodification of artworks such as paintings and of museum artefacts. The cartoon illustrates the problem of funding art galleries and museums, and the increased reliance on museum gift shops and cafes. A comment on the proposed high speed rail service, HS2. A cartoon about the fact that the rise in the human population is threatening the ecosystem of the earth. Some people think that rather than trying to prevent climate change and global warming we should treat climate change as inevitable and adapt to it. I’ve been drawing cartoons about environmental issues since my student days. I think my first one was a cartoon about the use of ambergris (extracted from sperm whales) in cosmetics. That was back in about 1970. I’m still at it today. Now I’ve started to combine drawing cartoons about the environment with a bit of practical work on the subject, managing my home at Lower Rosemorran on the hills in the west of Cornwall for the benefit of wildlife. 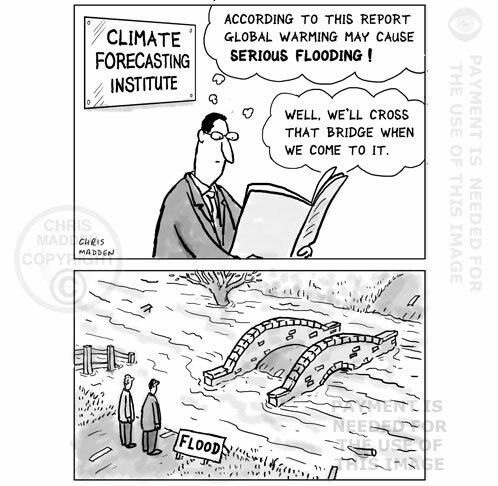 Click on the cartoon to see the rest of my environment cartoons. An illustration showing the earth as a passenger balloon, with people throwing consumer goods over the side in order to keep afloat. The idea is that the human race needs to jettison its dependence on consumer goods. The cartoon illustrated how in the modern world we assume everything has to be powered by a relatively modern form of power, such as electricity in the form of batteries or mains electricity. 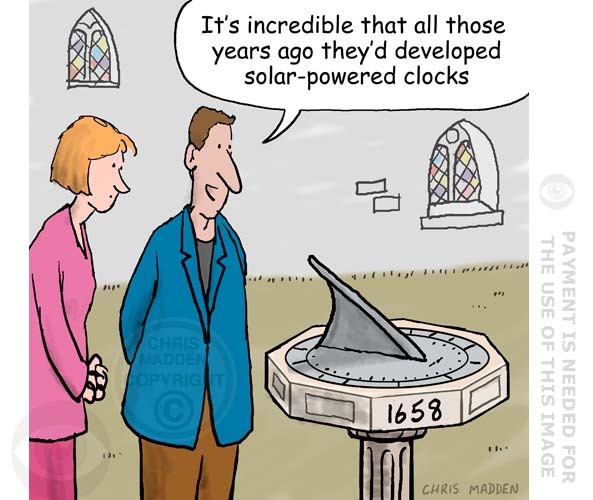 In the past everything was powered by “sustainable” or “natural” resources, such as solar power, the wind or water. The image is an illustration of the way that the human race is destroying the planet by over consumption and over population. Over population is implied by the giant size of a single human who is devouring the earth’s resources. The tree of knowledge discovers where paper comes from. Tree of knowledge discovers a disturbing truth. This cartoon may be used as an environmental cartoon about the use of wood for the production of paper products. It may also be used as an illustration concerning the human condition – about the way that people, through their own intelligence, have become aware of the ultimate fate of all of us, death. (a fate that other species of animal are possibly blissfully unaware in any deep way). The cartoon is also about the way that human intelligence as well as bringing about awareness has brought us to the situation in which we are destroying the environment. A cartoon about child development and shopping. 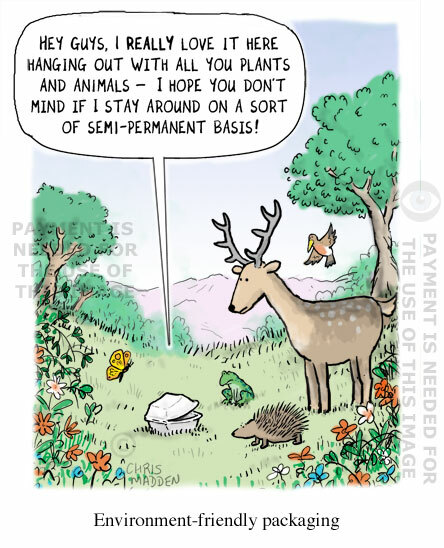 A humorous idea about nature or nurture, social attitudes, capitalism and social conditioning. A cartoon showing a reconstruction of an extinct animal, with scientists asking why the creature became extinct. In the cartoon the earth is pouring through the hourglass, showing that time is running out for the world as a result of environmental pressures. A cartoon about climate change, global warming and mineral resource depletion. 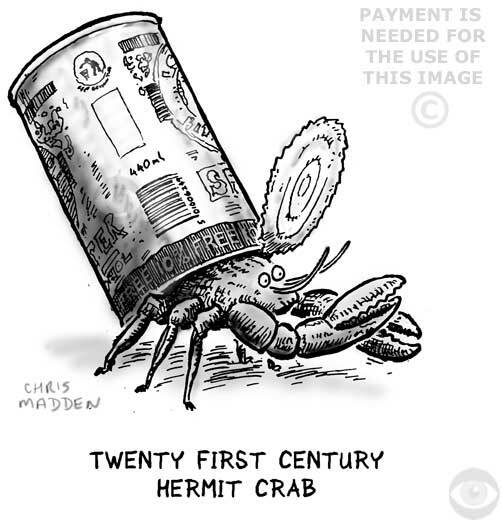 The original version of this cartoon was drawn in 1991 for my book “When Humans Roamed the Earth”. The earth is pouring through the hourglass like sand, showing that time is running out for the world as we know it, as a result of anthropogenic environmental degradation. An illustration about climate change, global warming, resource depletion and mineral use. The cartoon shows a boat in the form of a globe. To power the boat the occupants (the human race) are digging the inside out of the boat (or in other words, digging the inside out of the planet by mining it). A cartoon showing the earth or globe dropping off its mount and falling into a rubbish bin. 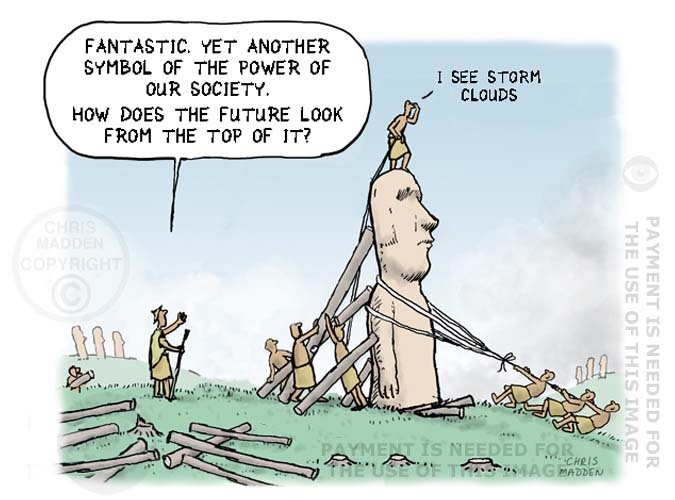 This is a cartoon about predictions of the future of the world as a result of man-made or anthropogenic environmental changes such as global warming, climate change, resource depletion, species extinction, human population increase – the list goes on! A cartoon showing the earth or globe inside a car, with a tube connecting the car’s exhaust pipe to the inside of the car. 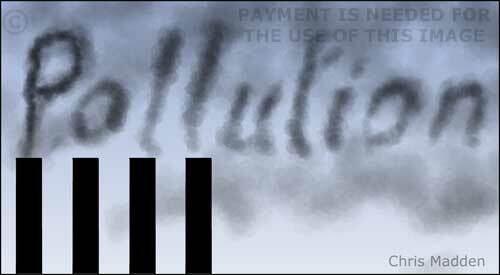 The implication of the cartoon is that the earth is committing suicide by poisoning itself on vehicle exhaust fumes. An illustration showing the earth or globe as the bulb of a thermometer that is measuring the temperature rise caused by anthropogenic global warming. Are wind turbines a blot on the landscape? A motorist on a crowded motorway complaining that wind turbines are eyesores. 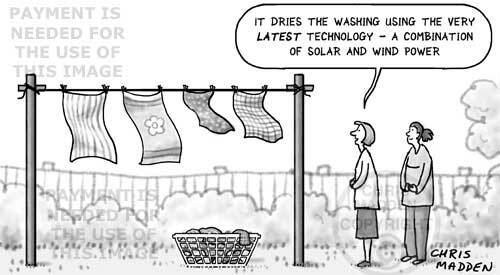 A cartoon about renewable energy, electricity generation, road policy, sustainable development and sustainability.